What are OER? And Open Textbooks? Support for integrating and linking OERs and important supplementary/ancillary materials into Talon. Kirkwood Community College supports faculty adoption of open resources. Open resources benefit students and faculty by providing course materials at no or low cost, and customize materials to suit the needs of students and faculty. To read more about it see the complete program description. To see what your fellow faculty OER adopters are talking about, see our OER @ Kirkwood Faculty Blog. 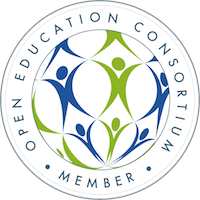 Kirkwood Community College is a proud member of the Open Education Consortium! Great quick article on OER adoption by librarian Steven Bell of Temple University. 2014 article that offers a vision for how librarians and faculty can collaborate in making OER more widely adopted by faculty and make higher education more affordable for students. Licensed by the author/creator with rights that are less restrictive than copyright (i.e. all rights reserved). This license typically (though not always) includes the right of any user to copy (digitally) & print the text as well as the right to adapt it as desired for use in a course, as long as authorship is attributed and use is non-commercial. Open Textbook is a specific type of OER that is designed to be a free or low cost substitute for a traditional textbook. 1. Define your need: Do you want to piece together a variety of resources, or find a whole textbook replacement? Using a backwards design approach and working from your course learning objectives can be a great way to keep your search organized and on track. 3. Identify & Evaluate: There are many considerations when evaluating OER, some the same as where adopting a traditional textbook, some unique to OER. 4. Adoption: There are often multiple stakeholders in your choice of course materials, including your discipline colleagues, your dean, and the bookstore. In fact, this could be step one, because these are the same people who could potentially be great allies in your changeover to open resources. 5. Use: How will students access and use these resources? Will you post a link to materials in your LMS (Talon)? Will students need paper copies, such as for a lab book or readings to be used in class? There are many options for having materials printed, and Kirkwood's Bookstore is a great resource for discussing your options. Because of the open licensing of OER, the Bookstore can often have a whole book printed for students at a very low cost. This site helps you organize learning objectives, resources and assignments for your course. Great downloadable forms and worksheets. A faculty resource for adopting, using and re-purposing openly licensed educational resources. This course provides faculty with an introduction to the laws that influence the use, re-use, and distribution of content they may want to use in a course. Activities include finding openly licensed content for use in a class and publishing openly licensed works created by faculty. At the end of the course, students will have openly licensed content that will be ready for use in a course. "This course walks you through techniques to incorporate Open Educational Resources (OER) into your teaching practice. The course will cover the fundamental aspects of OER including open licensing and public domain. It focuses on providing practical guidance in locating and applying openly available resources." Q: It's nice to save students money, but my students truly need print books. Doesn't that mean I need to stick with traditional textbook publishers? A: There is always a print option for OER. Sometimes the OER platform itself will offer a printed and bound textbook which can be ordered directly from the website, or purchase can be brokered through the Kirkwood Bookstore, as a traditional textbook would be. Because students are mostly only paying for the actual print and distribution costs, the price of the printed OER will still be substantially lower than that of a traditional textbook. If a printed copy isn't available, or if you are using your own compilation of OER (and/or some copyrighted materials that you've determined fall under fair use), the Kirkwood Bookstore will work with you to create a course pack for your students to purchase at the Bookstore, again, at a substantially lower cost than a traditional textbook. Q: I understand that textbooks can be very expensive, but I don't want to take business away from our bookstore. Doesn't the bookstore need us to continue in the way we always have? A: There are a few different responses to this concern. Using OER doesn't necessarily mean e-book only, and doesn't necessarily mean the bookstore won't have any profits. The open licensing typically means that materials are free online and low-cost to print. This means the bookstore might work with print services to offer a print copy for sale through the bookstore, or it might mean the bookstore works with a publisher of printed and bound OER books to provide copies for sale at a substantially lower price than traditional textbooks. Another way to look at it is that bookstores are changing with technologies as we all do, Kirkwood's EagleTech store being a perfect example of this. Q: As a faculty I depend on the test banks that publishers provide with a textbook adoption. Do OER or Open Textbooks provide test banks? And if they're open, what's to prevent a student for getting access to them? "In terms of "protected" resources such as test banks, you have to find a way for students to not be able to access these. And, you don't want to openly license these because then you have no way to combat them being published. At Rice University’s OpenStax College, our website is set-up so faculty have to first register for an account and then request faculty access prior to being able to download them. We check every single account to ensure the right official email is used, they are in fact teaching a course where they would need the resources, etc. Sometimes we even call the department chair directly to make sure we should be providing access, so this is definitely a labor-intensive process, but I think it is worth it to protect the resources. Faculty should also be very careful not to post any protected OER resources in a public environment, such as a website." Q: I am nervous about letting go of my textbook because I don't know if OER/Open Textbook authors will keep the resources up to date. How can I trust that the resources I select will be kept current and accurate? A: It's true that adopting open resources in place of a traditionally published textbook involves a change in how you think about your course textbook. Adopting OER involves a feeling of ownership of the course resources that you might not experience with a traditional textbook. Because of the open licensing you are free to update the material as you see fit, as long as it has the appropriate Creative Commons licensing. Due to the open nature of these resources, collaboration with other instructors (within our outside this institution) or with your students to improve the open resources you use is a common occurance, and means the work of updating is spread across many people instead of sitting solely with you. Yes, it's a shift of perspective, but it's an exciting one, full of potential. Also: there are a growing number of open textbooks that have the kind of publisher services faculty expect, with regular updates, printed and bound copies available for purchase, test banks and other instructor supplementals. See especially OpenStax and BCCampus. Why would an author give away their work for free if it is high quality? How is this model sustainable? 1. OER authors still retain ownership of their creations. Creative Commons (a form of open licensing) actually gives authors very precise control over how their work may be used and how it should be attributed. In fact OER authors often enjoy more freedom to use, share and adapt their own works than they would under a restrictive license with a publisher. 2. Many OER authors do get paid for their work, they simply don’t receive royalties. Some are paid by their college through a stipend, some are awarded grants through non-profit organizations or government agencies. Do you have a question about OER? Please ask! Traditional Textbooks vs. OER: What's the same and what's different? This quick and simple brochure on open textbooks from the CCCOER is a great little resource. Download, print and share widely! A collection of printable and fillable documents to guide faculty through process of adopting OER for their courses. All materials are licensed under a Creative Commons Attribution License.